Yes, yes, it is true! I like to keep things around the house “just in case” there is a need for it later. This is not a habit (read: borderline hording) that is favored by everyone in the house. If I am not freecycling something, I find myself removing the hardware and any other useful bits I might find a need for later and stowing them away for another day. There is nothing the naysayers like less then when I pull out some item that is perfectly suited for the next project. One such day when my store of items came in handy was in creating a game storage center for the Humane Society of Harford County (HSHC). Working on a Girl Scouts contribution project, we looked at the Society’s wish list where I saw that they needed some sort of container for games and crafts. I assumed that they kept these around for kids to play with while the parents filled out paperwork. The Girl Scouts collected may of the items that HSHC were looking for like treats, toys, blankets, and cleaning supplies while I started to think about the Game Cabinet. 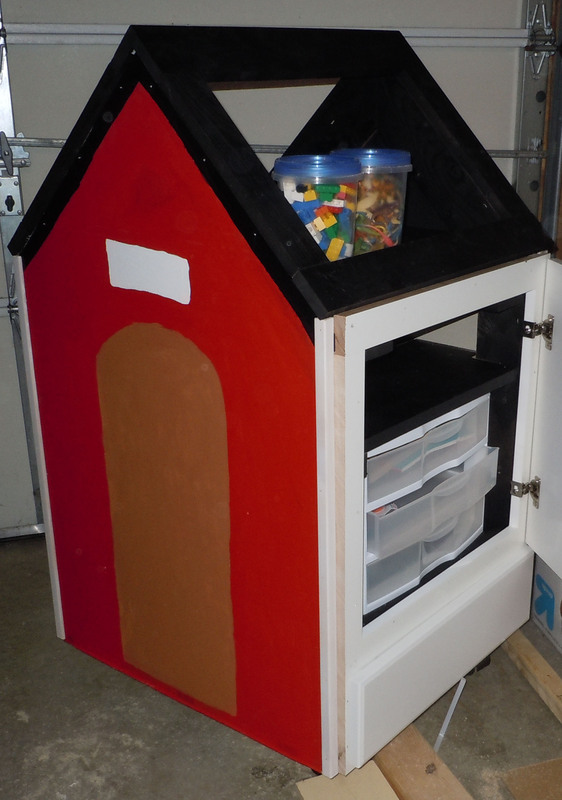 I got the idea to build the cabinet to look like a dog house. 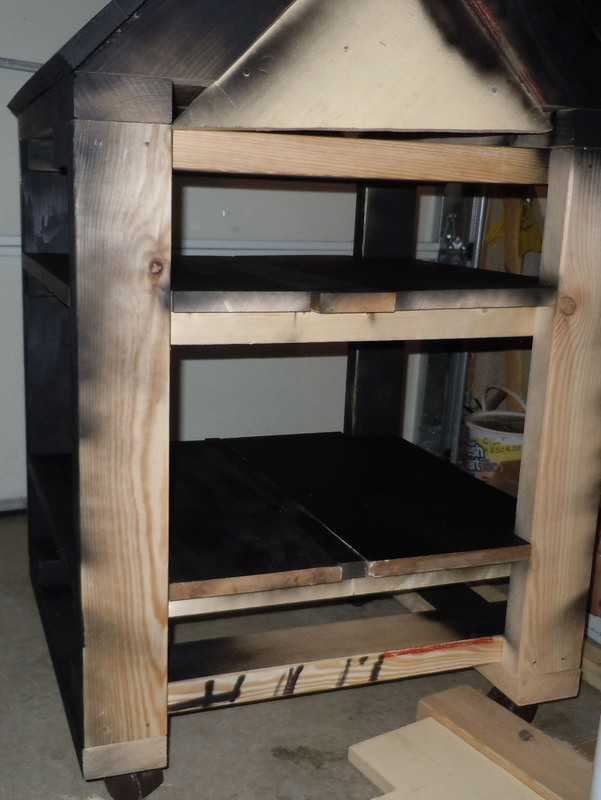 Except for the plywood I used for the front and back, all the materials came from my saved stash of goodies. Somewhere, I had acquired a set of cabinet doors which were setting in the basement for about 2 years. 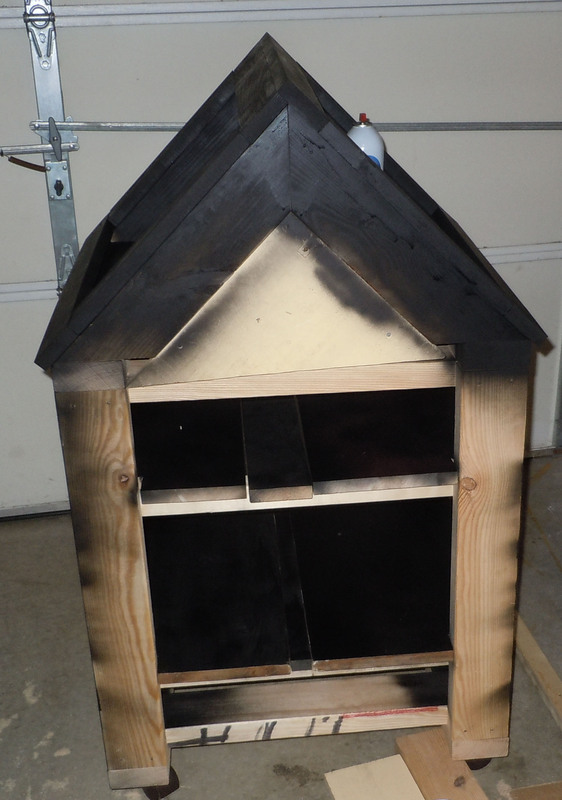 I also used some reclaimed lumber that was left over from a project to build 14 or so bird houses to donate with the scouts (more on that next later). I also dusted off a set of caster wheels that I saved when we discarded our old, old entertainment center years and years ago. I built the Base Dog House with some 2×4 scraps and created the shelves with the reclaimed lumber left over from the bird houses. 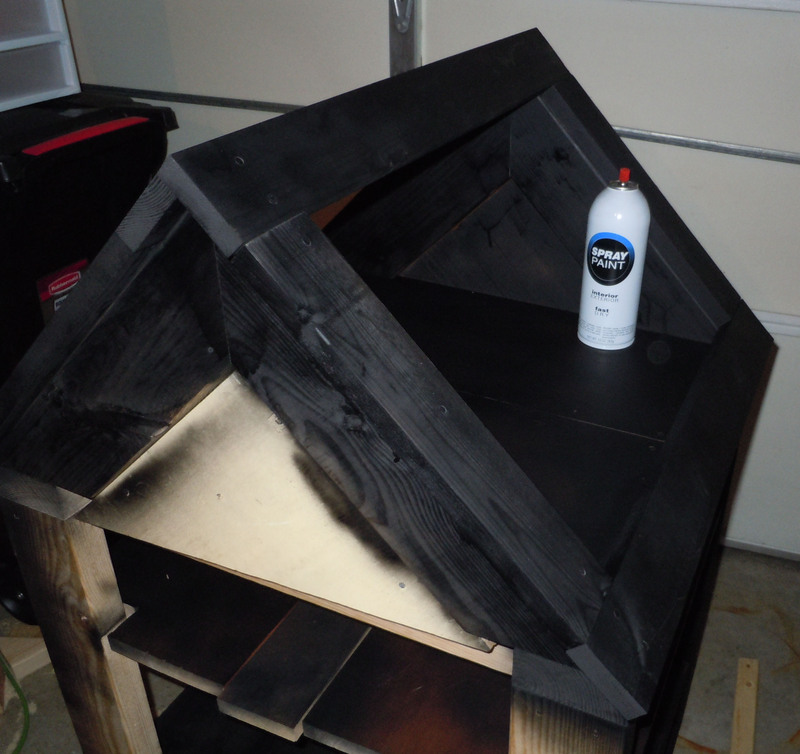 I sprayed the parts of the cabinet that you would see once complete with black spray paint and framed out the top. I decided to leave the top open to allow some items to be placed on top of the game cart and maximize space. Next, I Added the Front and rear panels and installed the doors. The doors that I had, were perfect! I’d say that they fit perfectly, which they did, but as anyone who re-purposes things knows, the doors only fit because I basically build the cabinet around them. Filled Game Cabinet almost complete, waiting for some final painted details. I got some help painting the dog house front and back including a doggy-door.Grass and a sign followed (see above). I filled the cabinet up with games and books that the girls scouts collected and off we went to the Humane Society of Harford County. They were happy to see the girls and receive the items that they were “wishing” for. They do some great work caring for and placing the animals and we were glad to lend a hand to help.